Being a fan of bubble tea, I had to try out Take Away in SS15 after walking past it a few times. I was attracted because of the lower price compared to Chatime. The place looks clean, plain and empty. However.... I find it odd that there are no seats available for customers. There are only a couple of chairs inside and it's for the staff. The entrance to the shop is blocked by a big banner, clearly indicating that customers are not allowed inside. Oh, shall we buy some bubble tea and sip happily on the roadside next to the drain? Sorry for the bad pic =/ This was all I managed to snap before leaving. 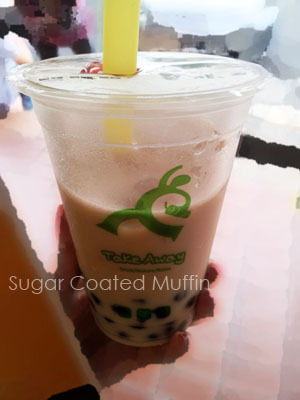 My Milk Tea with Bubble Jelly. One word : BAD! My IELTS teacher tells me to widen my vocab so.. Horrible/Terrible/Awful/Horrendous/Repulsive/Nasty/Unsatisfactory/Blah.. Pick one.. lol Tea taste was almost non existent and it didn't taste good. I could make better tea in my kitchen! 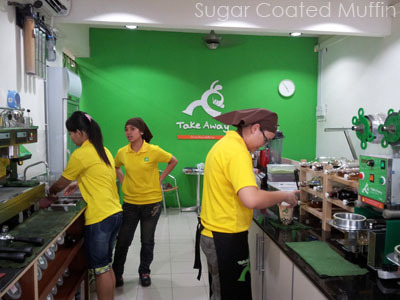 They have a range of Tea, Special Tea, Juice, Coffee, Smoothies & Milk Tea. You can add on things like bubble/lychee/rainbow/grass/coffee jelly for 50 cents to RM 1. Price ranges from RM 2.50 for Medium size to RM 5.80 for Large Coffee.